Mesa Community College (MCC) in Mesa, Ariz., serves the academic needs of nearly 26,000 students by offering more than 200 degrees and certificates in everything from biotechnology, computer science, and dental hygiene to mortuary science and urban horticulture. However, it was a re-dedication to music and the arts that gave birth to a new Performing Arts Center, acoustically fine-tuned with an inner and outer shell of sound-reflective masonry. It was not only functional, but artfully designed with musical themes. 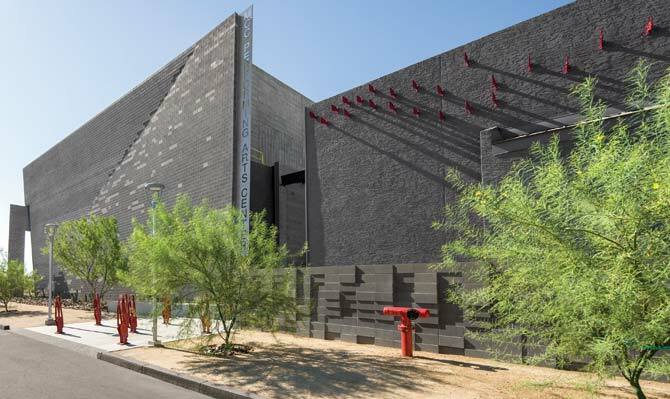 Inside, the theater is embedded in acoustical-enhancing masonry supplied by Oldcastle Architectural’s Echelon brand, where unique Trenwyth Trendstone walls—in the Black Canyon color pattern—support symphony, choir, band, jazz, percussion, and voice. It also blends seamlessly into the design scheme with the outer walls’ Architectural CMUs in Black Integral Color and Standard Gray. The transformation began when the college purchased the Harkins Movie Theatre, a vacant movie house built in 1979, to drive student interest in the arts and to offer a broad range of musical, dance, and theatrical performances. Designed by Jones Studio of Phoenix, the $10.3-million, multi-purpose facility, opened as the MCC Performing Arts Center in 2014, an enduring public face of the institution’s music and theater programs. In addition to a 462-seat main theatre, the new 44,000-square-foot structure features a full complement of classrooms, practice spaces, faculty offices, shops, and a lobby. Echelon’s matching colored concrete blocks feature an integrated water repellent, as does the Amerimix mortar used to install it to battle degradation from heavy downpours on a building that bakes in the sun most of the time. Serving as the project’s lead designer, Brian Farling, AIA and a Principal at Jones Studio, modeled the center’s architecture on the creative re-purposing of cherished songs and a deep respect of the Sonoran Desert. Comprising the center’s inner and outer shell, the variety of masonry was chosen both for structure and finish. For example, the architectonics of the new performance hall was defined by two separate enclosure shells and a steel frame. The exterior shell is a composition of exposed masonry and raked, unpainted cement stucco over metal stud framing. The second is an interior exposed masonry enclosure that defines the primary acoustic volume of the hall. 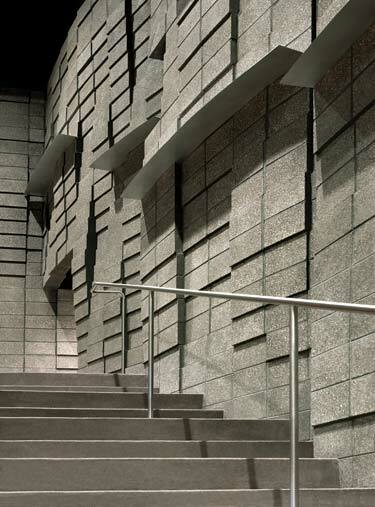 The sound chamber also was designed by Farling so that its Echelon Trendstone ground-face masonry units would strategically bump from the walls and serve as an excellent sound reflector. Moving north along the side walls, the bumps change from a module of five masonry units wide by five units tall, all the way down to a single 8x8x16 offsetting in and out to create small bumps. This variation in size allows for the smoother surfaces, or large bumps, along the front sidewalls to provide stronger early reflections that improve clarity. The smaller bumps along the rear sidewalls offer more diffuse reflections to enhance sound envelopment. The side walls of the hall also were scalloped in a series of convex curves to ensure sound waves are sprayed evenly throughout the audience chamber. 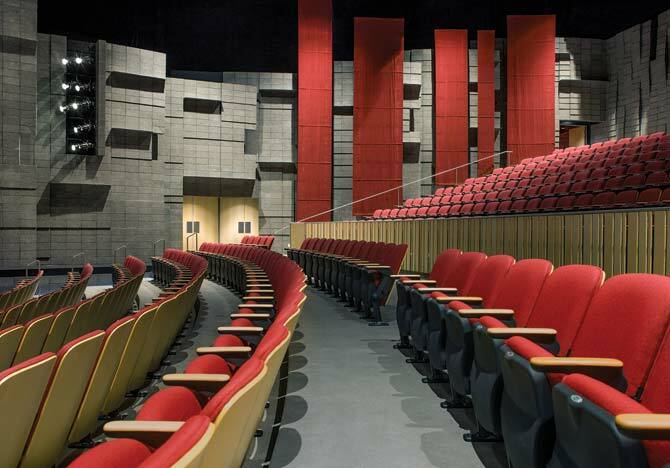 The 462-seat Mesa Community College Performing Arts Center serves as the face of the school’s music and theater programs, with masonry inside and out for beauty and enhanced acoustics. While the exterior shell features the standard gray 8x8x16 CMU block that transitions to charcoal color with graphics depicting the opening notes of Gershwin’s “Rhapsody in Blue,” the interior acoustic shell utilizes the same charcoal color, but with Trendstone’s smooth, polished ground face. 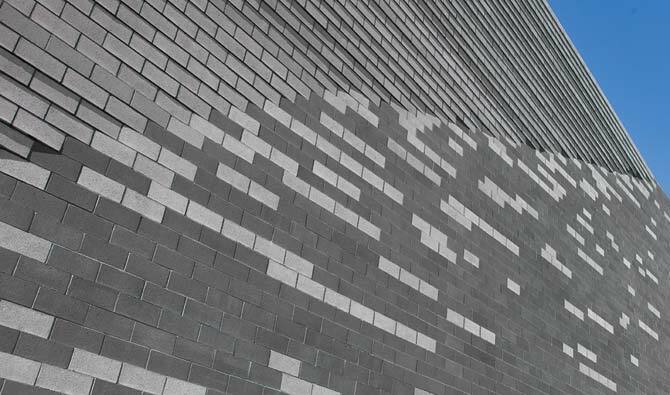 This acoustic masonry shell has many jobs to accomplish: sound distribution, interior structure, a durable finish, and a visually rich interior. The Trendstone’s density provided an excellent surface for the reflection of sound. The north and east exterior walls of the new performance hall also were arranged with a running bond pattern and sloped and folded to both emphasize the vertical marquee sign marking the main entry courtyard. The folded masonry wall slopes away from the sign, lifting it up to emphasize its presence. The slope is two-degrees off the horizon and was achieved by carefully cutting the stem courses of the masonry at the footing. 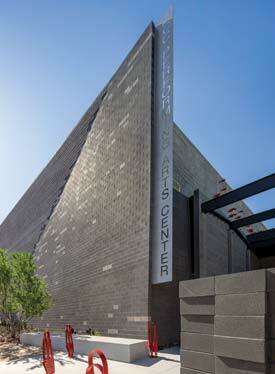 Designed by Jones Studio of Phoenix, the MCC Performing Arts features an exterior shell consisting of exposed masonry and raked, unpainted cement stucco over metal stud framing. This “marquee” wall was folded by virtue of an offset coursing detail that slips each block a maximum of 5/8” off center from the one below. The line of the fold ascends diagonally across the north elevation and has no offset. As the wall splays out in either direction, the offset goes from zero to 5/8”, creating the fold. This is further supported by the blending of gray- and charcoal-colored 8x8x16 concrete masonry units at this diagonal. 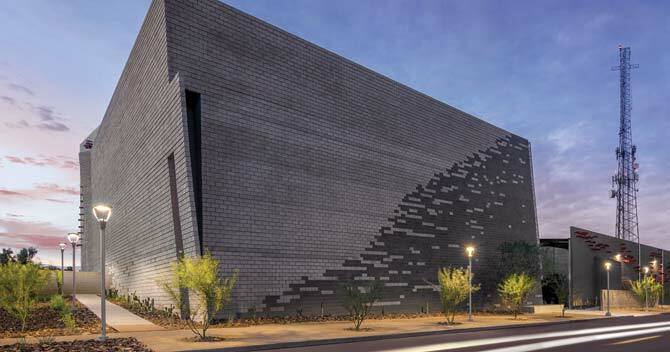 Arizona’s powerful rains were prominently referenced in the form of sloped folds that capture and funnel the rainwater into a flowing waterfall found at the northwest corner of the new building. “We passively harvested rain from 17,000 square feet of the roof, which drains into a sort of ‘knuckle’ with a hole in it—so with every rainfall you get a waterfall, emphasizing the infrequent occurrence,” said Farling. The waterfall’s downspout was also designed as the counterpoint to the vertical marquee sign marking the main entry courtyard. Echelon’s Trendstone ground-face masonry units were strategically bumped out on the interior walls to better reflect theater sound. Another interesting highlight is the role of music in the building’s design. Each of the patterns within the new masonry, exterior ornamentation, interior lighting, tile, and carpet were developed to reflect the diversity of the college’s character and as visual expressions of the influential music derived from MCC faculty and staff. “We found the variety of musical styles—Gershwin’s ‘Rhapsody in Blue,’ Mozart’s ‘Cosi Fan Tutti,’ ‘YYZ’ by Rush—to reflect the diversity of the college’s character,” explained Farling. To learn more about the MCC’s masonry features, visit www.EchelonMasonry.com. 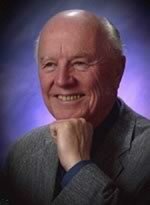 To learn more about the project and Jones Studio, visit http://jonesstudioinc.com/project/mesa-community-college-performing-arts-center. John Cicciarelli is director of masonry sales for Echelon, the consolidated portfolio of masonry products by Oldcastle Architectural. In this role, Cicciarelli oversees sales development for 13 individual companies covering the United States and portions of Canada. He can be reached at John.Cicciarelli@oldcastle.com. FMI, a provider of management consulting and investment banking to the engineering and construction industry, announces the release of The 2013 Second Quarter Nonresidential Construction Index report. The International Residential Code (IRC) for one- and two-family residences, and the International Building Code (IBC) for most other construction, usually is the adopted and applicable law governing design and construction. But it is essential to verify what code applies by obtaining a copy of the state law or local ordinance that applies to the specific construction, and that may contain amendments to the adopted code. The relationship between an architect and a contractor is not always smooth, but in the end they need to work as partners. After a few successful projects, perhaps the intermediate relationship problems can be nearly eliminated and the teamwork can be established early in a project. In this way, the masonry contractor has familiarity with the architect’s design concepts and the architect has the benefit of the masonry contractor’s hands-on experience in creating specifications for the job.